Actions: With a 2 in 1 formula to thoroughly clean and moisturize the skin to provide comfort while cleansing. Moisturizes and softens the skin while lifting away impurities. 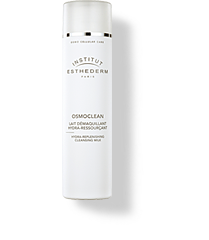 Acts in perfect osmosis with the skin while protecting the hydrolipid surface film. Activates the natural defense systems thanks to the production of a natural antiseptic that eliminates potentially harmful bacteria. Stimulates beneficial bacteria. Optimizes the cells energy environment and boosts their activity. Results: The skin is pure and clean, ready to benefit from subsequent skin care products. The skin is moisturized and cleansed. Has immediate and lasting comfort. Energized skin that functions at top capacity and protects itself against external aggressions. Indications: For all skin types especially dry skin. Mature skin. Any with discomfort associated with cleansing. For those who like comfortable textures. Instructions for use: Use both morning and evening. Apply with fingertips and rinse with tepid water.